Good morning from where I'd rather be! It's hard to think that this moment was just last week before the weekend that was the biggest of our lives. I mean, when these photos were taken Brad and I were boyfriend and girlfriend, and now we're husband and wife! How crazy is that? I feel like life is going at a million an hour right now, but I truly wouldn’t have it any other way. 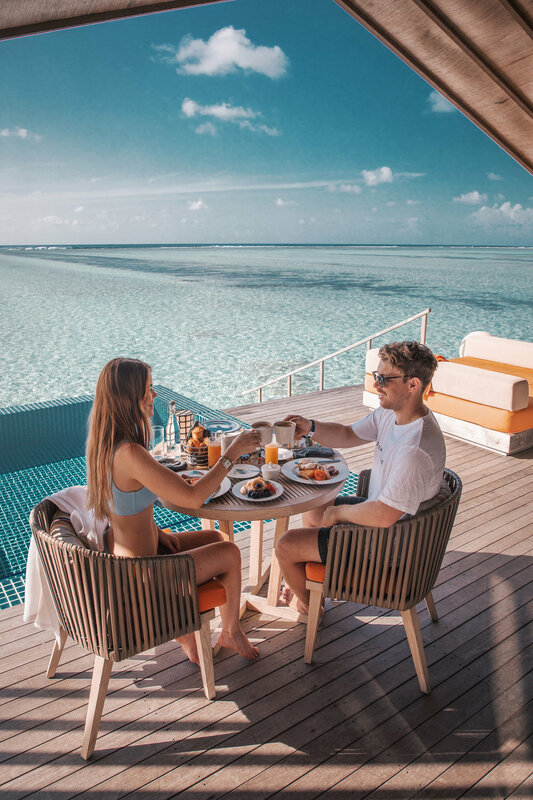 Okay, okay, well maybe I’d prefer to have a few more relaxing mornings like this one with a view just like that. I mean, how incredibly beautiful is the Maldives? 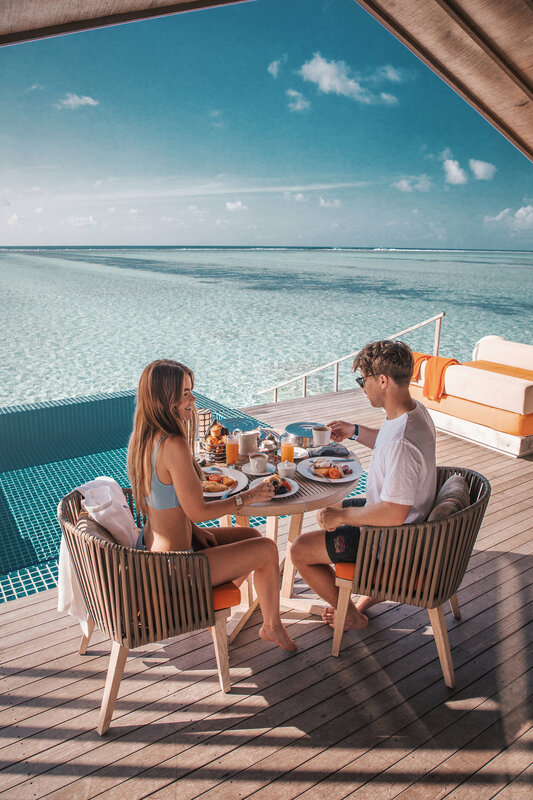 We actually got up every morning to watch the sunrise from our overwater villa, which is the perfect way to begin the day, if you ask me. Of course, Brad took a little convincing to get up that early, even for a beautiful sunrise like the ones we experienced. He was always up in-time for breakfast though, and can you blame him with a spread like that? 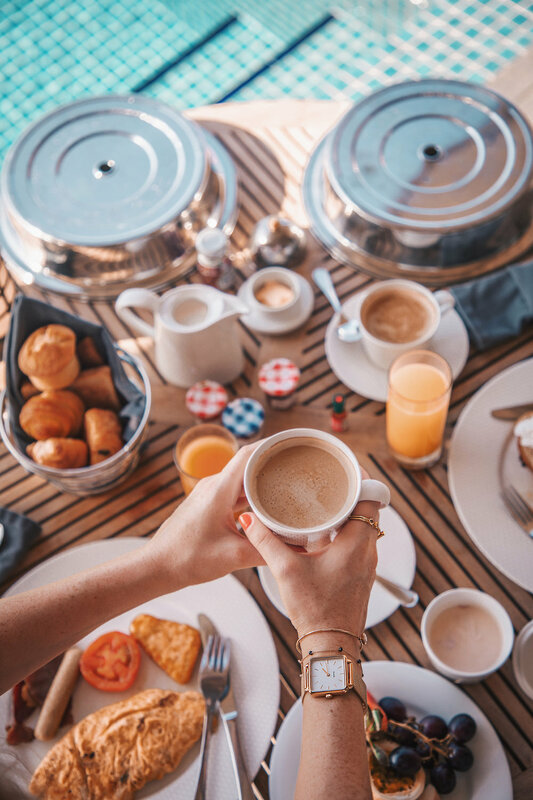 Enjoying our coffees and croissants while admiring the view across the turquoise lagoon, dressed in nothing but a bikini and CLUSE accessories, was an A.M. tradition I’d rather not have given up. It was surreal actually, eating breakfast, and watching stingrays and reef sharks swimming by. I simply couldn’t keep my eyes off the crystal clear water – I was mesmerised! Since we spent most of our time in and out of the pool (including through breakfast to cool down), I sported a simple bikini on most days in our villa. 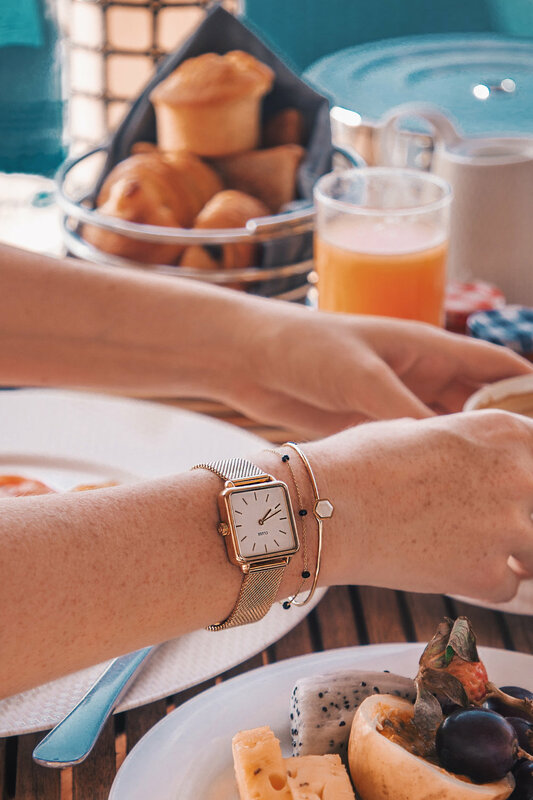 I had lots of fun accessorising my island look with a CLUSE watch (the minimalist gold La Garçonne once again – no surprises there!) and layers of jewellery, especially now that they’ve added earrings and rings to the mix. On this morning I decided to go with the open circle stud earrings, marble bar ring and hexagon ring set. Speaking of a fast paced life, after a whole weekend of wedding festivities (you can check them out on the @lioninthewild Instagram for now) and pretty much the most amazing few days of my entire life thanks to my wonderful hubby ❤️, we’re back at the airport waiting to board a plane for our next adventure. Like I said, non-stop! CLUSE La Garçonne watch in Gold, CLUSE gold earrings, necklaces, bracelets and rings, and ASOS bikini.